I bought some new clothes a couple of days go and had to buy a size 8 and 10 in some of the pants!!! I haven't worn a size 8 in over 30 years. Before my surgery I was buying 20/22 size clothing. Initially my goal was 150 pounds, which I will easily reach and most likely surpass. I have not been able to get in as much exercise as I was a few weeks ago, so the weight loss has slowed down a bit. I no longer take medication for high blood sugar and recent blood tests confirmed that everything is within normal ranges. 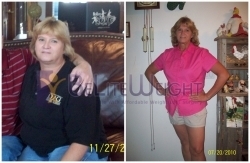 The surgery was one of the best investments in my health I have ever made. Dr. Rodriguez, Dr. Aramburo and JoAnne's entire staff is terrific. I appreciate the opportunity to tell what wonderful progress I have made.